Planning a family trip? 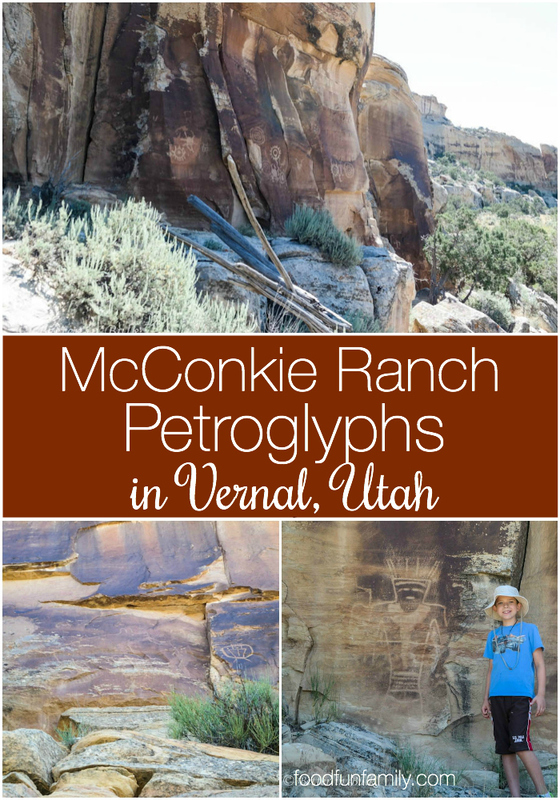 You are going to LOVE the McConkie Ranch Petroglyphs in Vernal, Utah, but there are a few things you should know before you go! 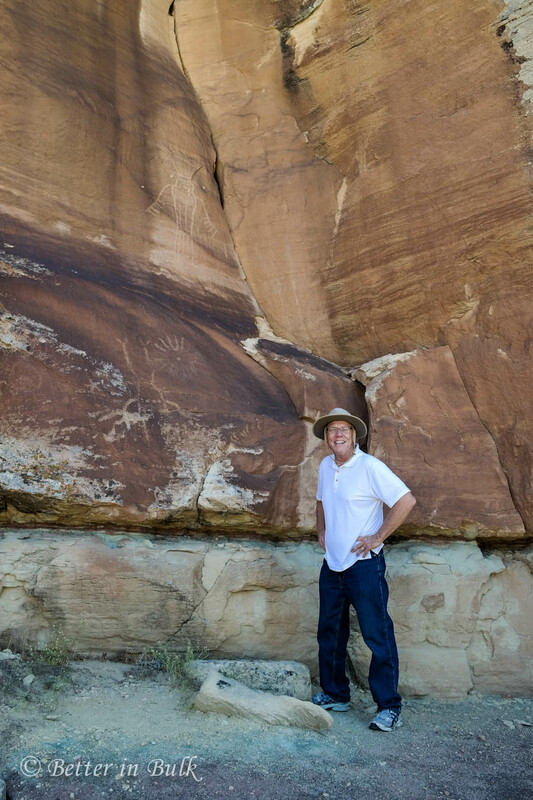 One of my favorite days of my summer road trip was the day that I spent at the McConkie Ranch Petroglyphs in Vernal, Utah (up Dry Fork Canyon). 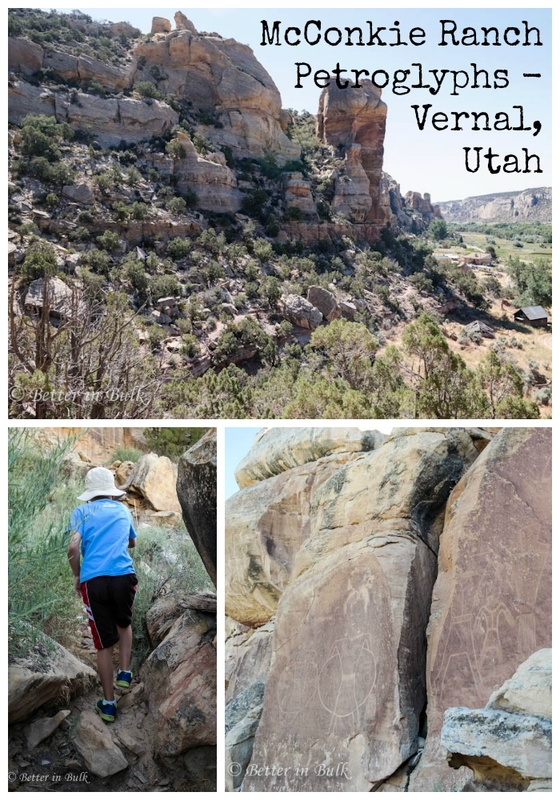 While my husband and oldest son were off hiking the High Uintas and my girls were all visiting my oldest daughter’s college campus, my mom, dad, and youngest son AJ headed to Vernal for some exploring. We had a blast. 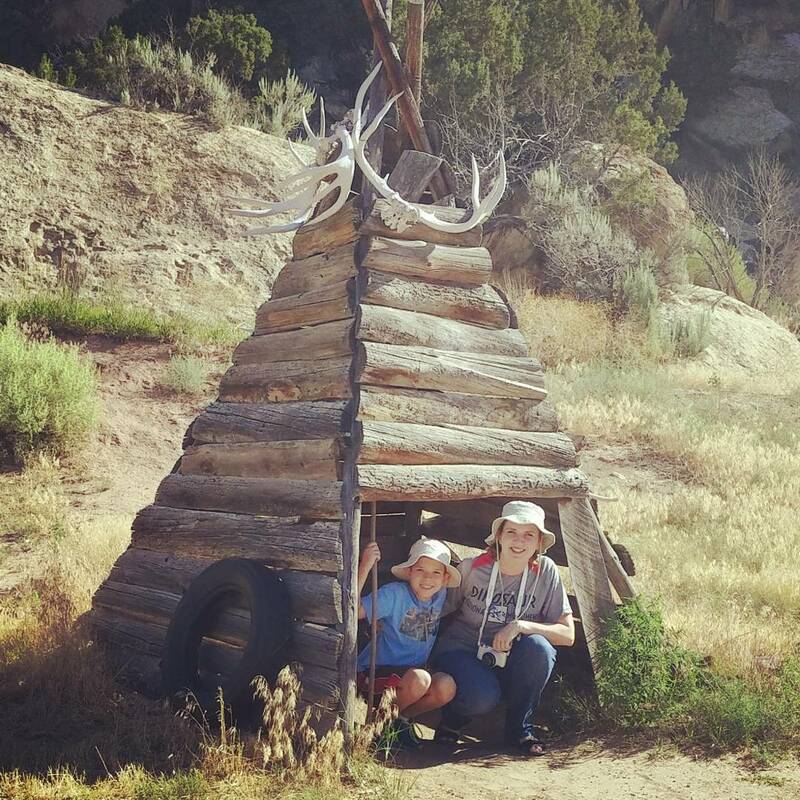 In fact, my mom and I commented that our 2 days in Vernal felt like a true vacation (sometimes road tripping, as wonderful as it is, is not extremely relaxing. Adventurous and exciting, yes…but not so relaxing. 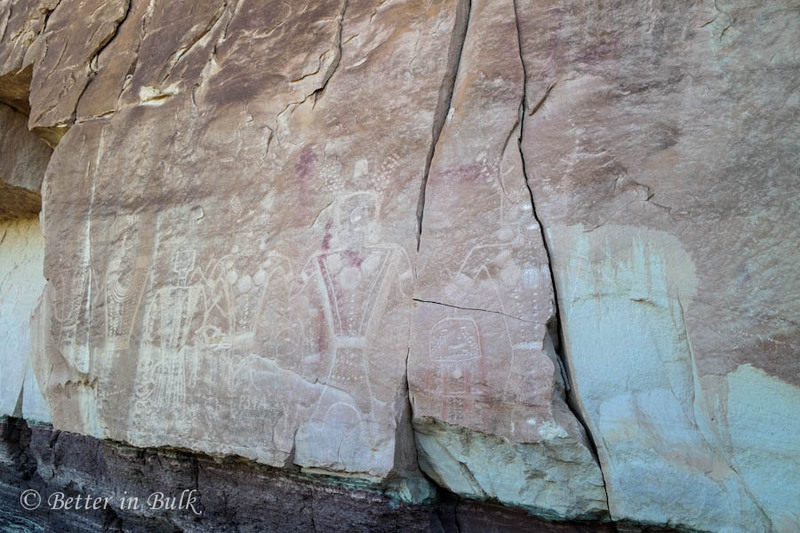 One of the things that caught my eye when we were planning our trip to Vernal was the chance to see petroglyphs (an image or design cut into a rock surface) and pictographs (paintings on sandstone surfaces). 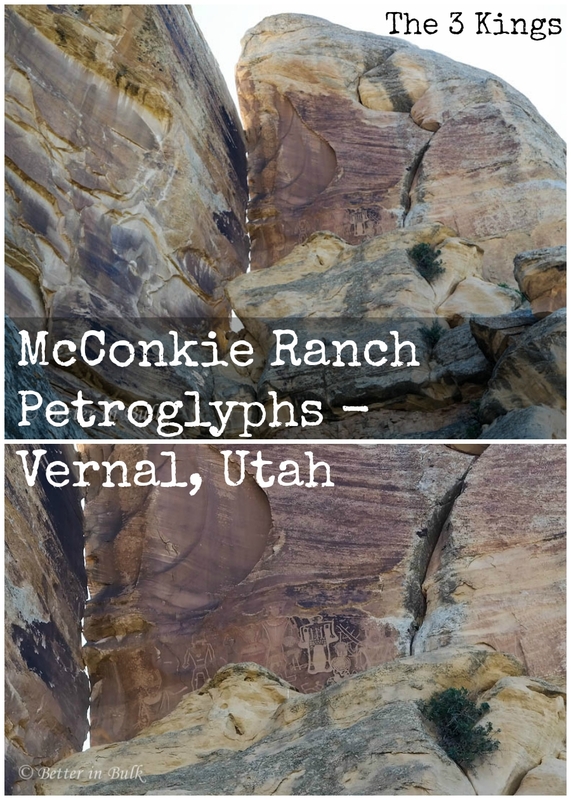 The petroglyphs and pictographs that we saw at the McConkie Ranch, a privately owned property, date from about 100 to 1200 A.D. There is huge variation in the style of the drawings but they are all fascinating. We loved the time that we spent there and felt like true adventurers! Note: these tips apply specifically to visiting during the summer months, but you can visit anytime! Wear jeans and good walking/hiking shoes and a hat. We hiked in the heat of the summer, but those of us that wore jeans were much better off than those that wore shorts or capris. Why? The rocks on the main trail are sharp and there are plenty of opportunities to get hurt or scratched. Bring lots of water. 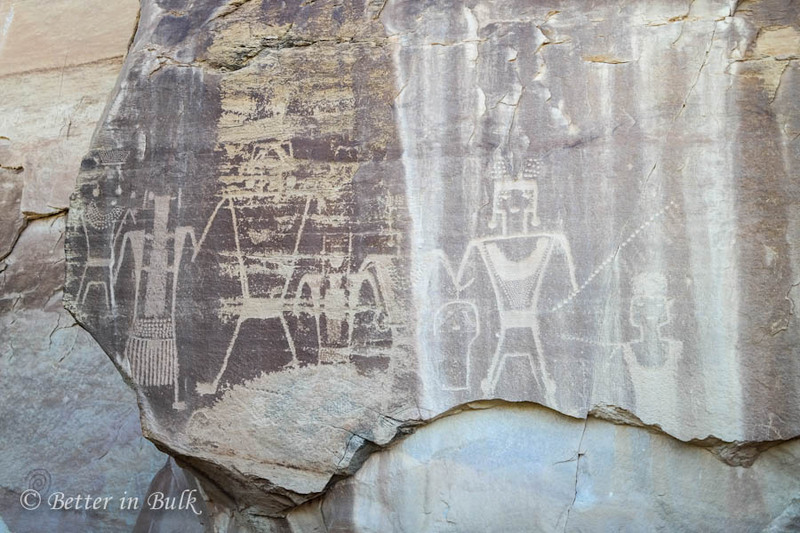 We had plenty of water in the car, but we were not expecting the hike up to see the petroglyphs to be quite so long. Especially on hot days it’s important to be prepared with plenty to drink. Grab a walking stick. There’s a can full of walking sticks at the beginning of the main trail, outside the little donations building. Upon seeing the can, I thought, “Oh, what a cute idea!” My 10-year-old grabbed one…and the rest of us were jealous the whole hike! Admission is a $5 donation. And it’s all on the honor system. There’s a shack at the parking lot where you can leave donations. 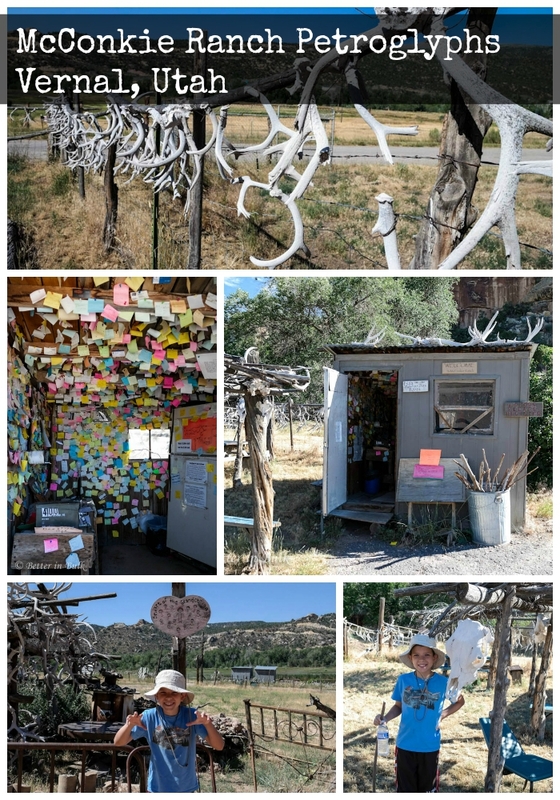 You can also purchase $1 bottled water from the fridge and leave notes of appreciation or stories on sticky notes (the shack was a fascinating thing to explore by itself!). The owner, who lives on site, leaves her cell phone in case anyone needs to get in touch with her with questions or issues. It’s a very friendly place! When you see the fork in the main trail, keep going!There was a path to head back down to the parking lot, but we decided to follow the sign that said, “more petroglyphs.” Keep following the signs until you get to the nobbly kneed twins. The trail keeps going beyond what you think it will. 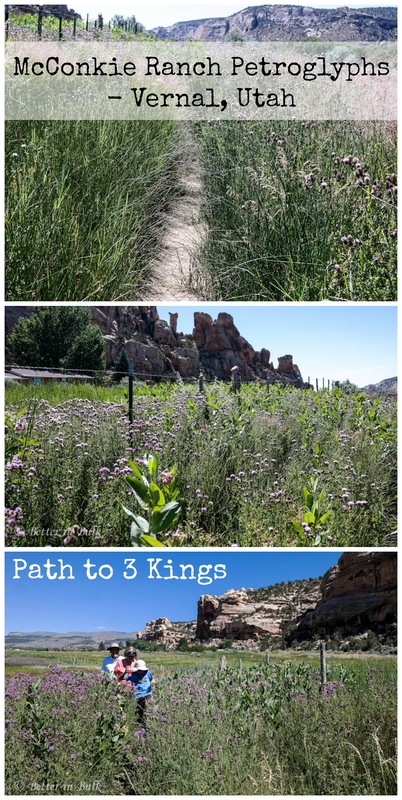 Remember that there are 2 totally separate areas.The main trail at the parking lot is longer and harder than the 3 Kings Trail. But I recommend doing both! 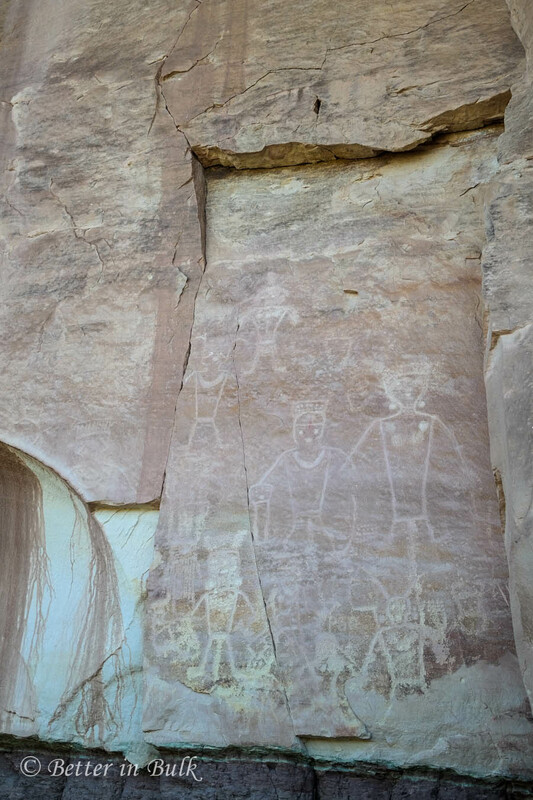 The 3 Kings (and other petroglyphs) are separated from the main section and you literally have to walk around the neighbor’s property to get to it. To get to the 3 Kings petroglyph (which has appeared in National Geographic and is the most spectacular of the petroglyphs here) we had to walk through a field of tall grasses and thistles. The field was full (and I mean FULL) of bees and grasshoppers and other winged creatures. Bare legs WILL get scratched, and I don’t recommend this part for people with bad allergies – especially bee allergies. We all pretended that the insects weren’t there. Nobody bothered us at all. Bring binoculars to see the 3 Kings OR a good zoom lens. It’s WAY up there. 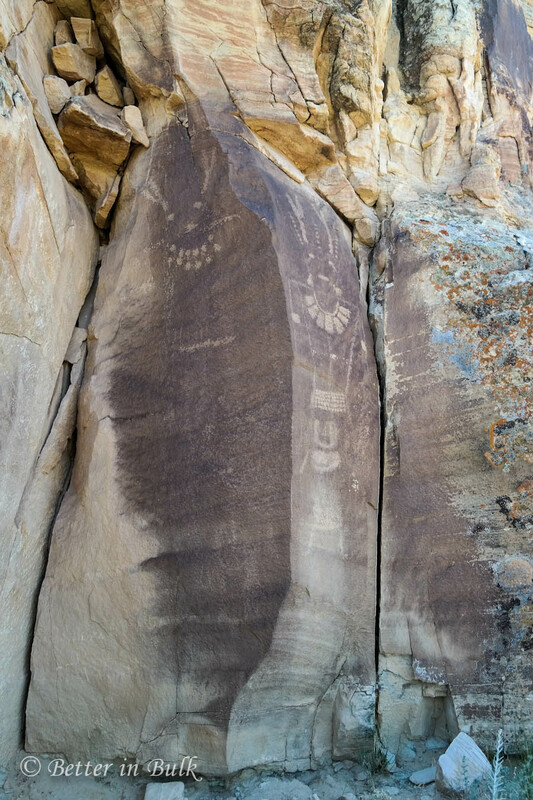 Expect crude trails and loose rock and sand.Remember that this is private property…that someone has opened up their back yard to share the amazing art with anyone who has the desire to see it. 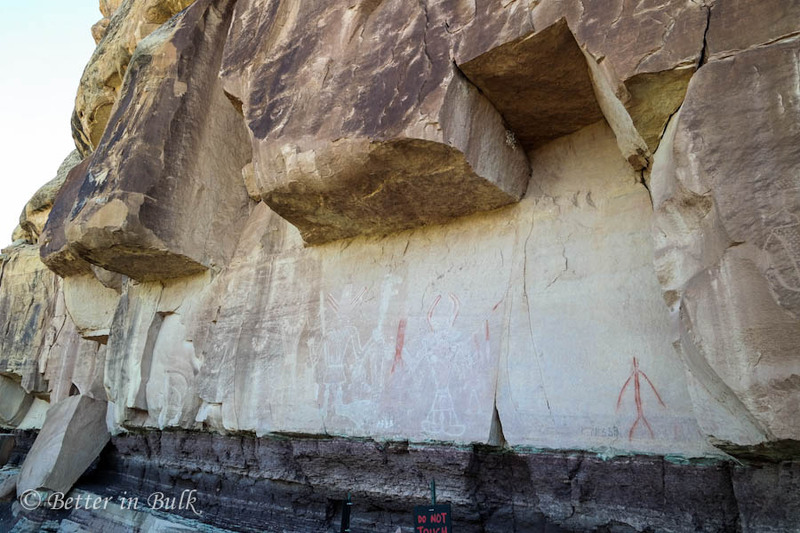 It is not “National Park quality.” But then again….you usually can’t get this close to history at a National Park. We loved feeling like explorers. It was like we were discovering something no one else had seen before. We loved it! What have you been up to lately? Share your latest photos below! That is so neat and beautiful to see in person! What a fun outing!